Authorities to investigate last night's funeral of Umm al Fahm man who attempted to stab Israeli Border Police officers. Israeli authorities have opened an investigation into the recent funeral of an Israeli Arab terrorist who was shot and killed while attempting to stab Border Police officers in the Old City of Jerusalem. On Friday, 31-year-old Ahmad Mahameed approached several police officers near the Temple Mount on Friday afternoon while brandishing a knife. After lunging at the officers, Mahameed was shot and killed. No officers were injured in the attack. Mahameed’s family, as well as the city of Umm al-Fahm, later claimed he was mentally ill and should not have been killed. On Monday, police returned Mahameed’s remains to his family for burial, on the condition that the funeral adhere to the restrictions imposed by police for terrorist funerals. Israeli law enforcement officials have often conditioned the return of terrorists’ remains to their families on a series of limitations on the size and character of funeral services, in order to prevent the funerals from becoming mass public demonstrations of support for the slain terrorist. In the past, hundreds, and in some cases even thousands of mourners have taken part in funeral processions for slain terrorists, with participants calling for future terror attacks. The Mahameed family agreed to the conditions listed by Israel Police, which included limiting the number of participants in the funeral service to 150, and provided authorities with a 50,000 shekel ($13,692) retainer to guarantee compliance. 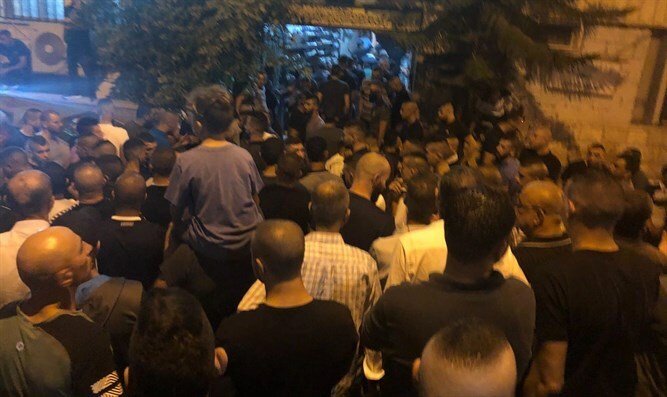 Despite the promise to adhere to the agreement, however, thousands attended the funeral in Umm al Fahm Monday night, prompting police to keep the 50,000 shekels put up by the family. “The conditions set by the police were violated last night,” a police spokesperson said Tuesday.